It calls for cranberry juice. Great we’ll use that. It calls for orange juice & I have that. Next is orange sherbet, but I don’t like orange sherbet. How about raspberry? Do you like raspberry? Yes. Do you have any? No. I’ll stop & get some on the way to your house on Tuesday. The recipe also called for ginger ale, which neither of us had. I never knew that raspberry sherbet could be so hard to find back then. And, for some reason, so was ginger ale that year. The first four stores that I went to had neither item. I finally found the sherbet at the fifth store, but they didn’t have ginger ale. Not willing to go to store number six, I improvised and bought 7Up. The punch was delicious! Everyone absolutely loved it. From that party forward, Pilgrim Punch has been served at every party and holiday celebration that our family has. In fact, I could probably skip the turkey and dressing on Thanksgiving and as long as I served the punch, no one would care. Over the years, we would comment, “I wonder what the original recipe for Pilgrim Punch tastes like.” One Thanksgiving I diverted from the improvised version and made the original. It was fine, but we all agreed that our version is far superior. We rename the punch for whatever occasion is upon us. It is Pilgrim Punch, Reindeer Punch, Love Potion, Party Punch, etc. 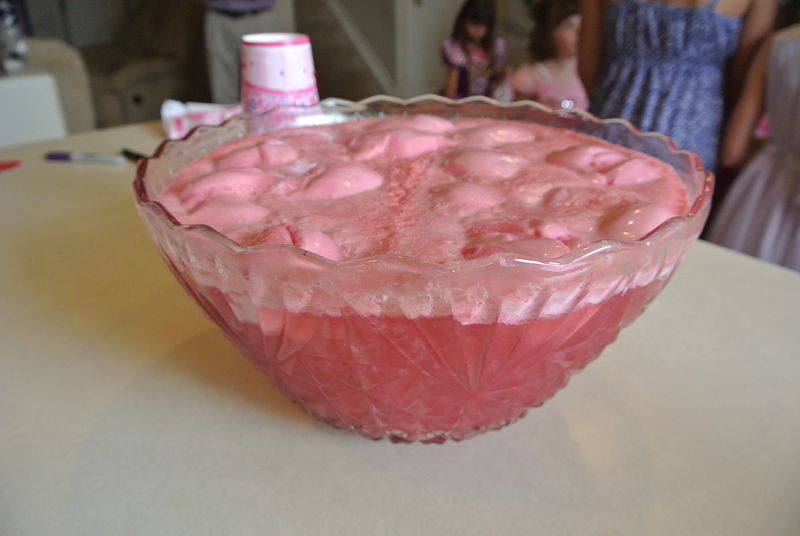 This past week, it was Princess Punch at our daughter’s princess themed birthday party.